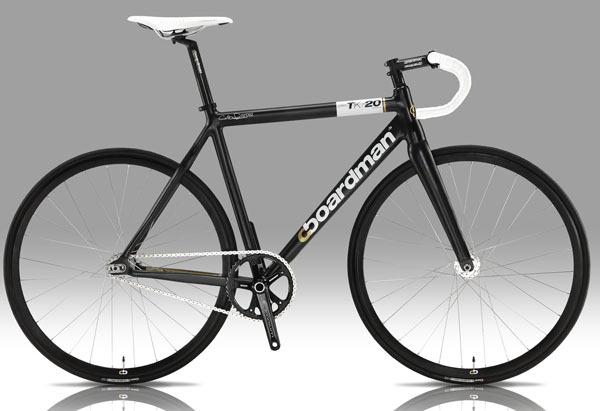 Boardman 20 Year Anniversary – Special Edition TK20 Track Bikes – Pre-Order NOW! In 1992 Chris Boardman announced himself to the world of cycling by winning the 4km Pursuit in Barcelona (the ﬁrst British Gold medal for 72 years) and simultaneously inspiring the next generation of great British cyclists. To celebrate the 20th anniversary of Chris’s success on the track Boardman Bikes has created the Elite Series TK/20 in a Limited Edition of 92 signed bikes. The TK/20 is a superlight, triple butted alloy frame with track-speciﬁc geometry, full aero carbon fork, tapered steerer and stainless steel dropout plates – in addition, the design also allows for brakes to be ﬁtted, making it road as well as track friendly. Chris Boardman – R&D Director, Boardman Bikes. The frame – combined with a great spec including Truvativ Omnium GXP chainset, Fizik Arione saddle and cboardman Carbon/Pro ﬁnishing kit – is ﬁnished off with Limited Edition graphics featuring gold decals and a metal head badge. The Limited Edition TK/20 is available to order NOW at Bike Science. Preorder now to reserve a piece of history, for September deliver. This entry was posted on Friday, August 3rd, 2012 at 12:37 pm	and is filed under All Posts, Boardman Elite Bikes, Products. You can follow any responses to this entry through the RSS 2.0 feed. Both comments and pings are currently closed.